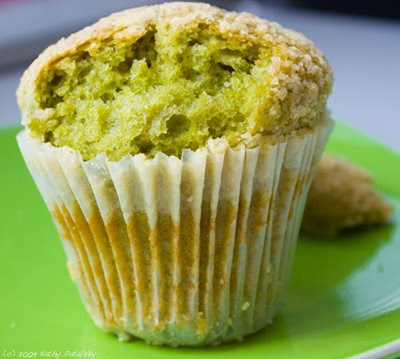 Le Pain Quotidien's Ginger Green Tea Muffin. Vegan! Better than Blueberry??? As many of you know, one of my favorite things in the world to eat is a vegan blueberry muffin from Le Pain Quotidien. 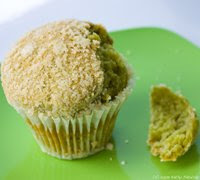 Well there's a new muffin on the shelf - the Ginger Green Tea Muffin - and it's serving up some serious muffin competition with its bright green tea powdered cake-like texture, a warm ginger buzz and soft white crumbles on top. New Muffin Smell. We ordered six Ginger-Green-Tea muffins to-go today. (Plus one lone blueberry.) I felt bad. We freeze them. Life's better with yummy muffins in storage. 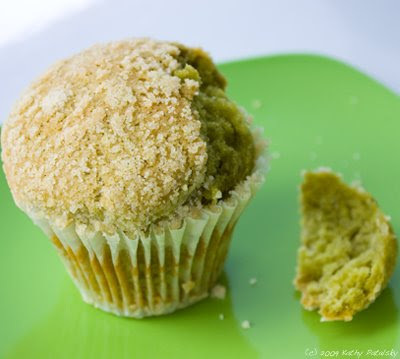 Shelf Appeal: At first I didn't know what this muffin was. I thought it was the old crumble-topped carrot muffin. But break open the top and a bright sea foam green fluff pops out. This muffin look humble from the outside, but the taste says it all. Taste Test: Amazing. The top is thick and almost crusty. But the inside is very moist and soft. The green tea is a accent flavor, but that ginger soars with a bursting zing in your mouth. Such an easy muffin to eat. Consistent taste throughout. Even the base is perfect. Label Check: Still no nutrition info on the site. 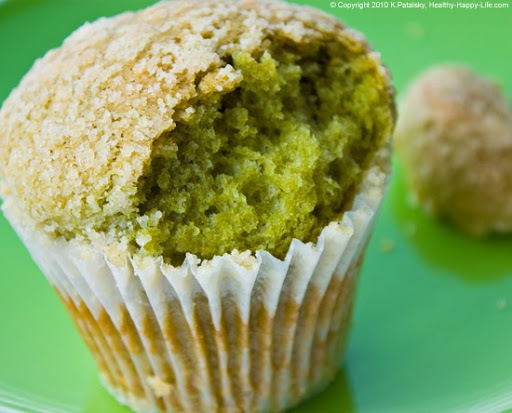 Usually Le Pain is great at adding calorie content, but this muffin is a no-show. It is vegan and the taste is not too sweet, heavy or oily. Thus, I'd GUESS around 340 calories per muffin. Maybe 7 grams of fat?? Total guess. But simply tastes healthy. That ginger is great for a tired tummy. Price: Typical Le Pain muffin price. Varies per store, but around $2.85. Worth it. Worth it. Worth it. Last Word: Ties for first with my blueberry muffin favorite. I'm loyal to long-time favorites. But that tie says a lot!